Numigo protects your valuables against loss and theft! register your valuable items in our database and mark them with a unique Numigo identifier. It is easy to mark your valuables: You can print your own labels for free or you can buy high-quality labels and key tags in our shop. 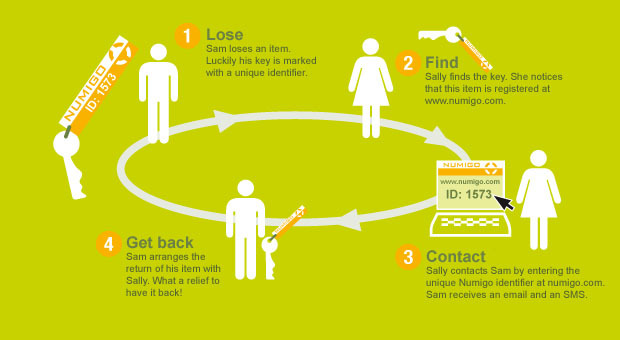 Each label or tag directs anybody who finds your lost item to the Numigo website where the finder enters the item's Numigo ID. Our system forwards his or her message to you via email and you receive a SMS. All you need to do then is to arrange the item's return. In this process, Numigo does never divulge your personal data to the finder. You can also use your Numigo account to manage and keep track of your belongings. Should some of your items be stolen or destroyed, you can easily provide necessary information about them to third parties such as the police or insurance companies. Learn more about the advantages and services provided by Numigo. Stop worrying � buy Numigo protection today! More..